The multi-user provisions of WordPress enable professional web developers to work on team based web design projects. Web developers now in most cases prefer WordPress for web development rather than opting to write an entire HTML code from scratch. But if WordPress is simplistic, that does not mean that a web designer can take any amount of liberties while designing a website with it. Every human being is prone to making mistakes. Many website developers while using WordPress tend to make silly mistakes which cause further problems by stalling the web development process. These silly mistakes sometimes even threaten the security of the website. So a web developer while using WordPress should be extra cautious to avoid such mistakes. Preventing them now is better than rectifying them later. 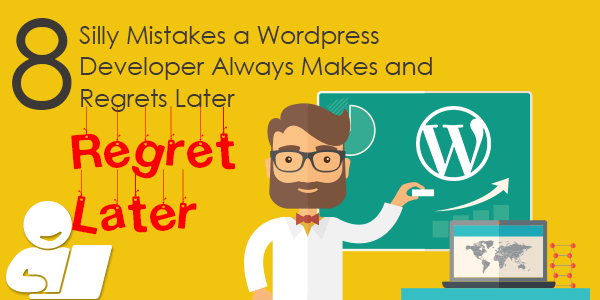 Here are a few common and silly mistakes which web developers tend to make with WordPress, which they regret later on. Admin is the most common username. In fact many devices have it as a factory set username or login name and WordPress also has a default username “Admin”. So should you be silly enough to keep using it as your username. Unfortunately many developers keep committing this same mistake over and over again. Hacking into your website becomes child’s play with such an obvious username.A hacker hardly needs to make an effort towards fulfilling his evil aspirations. Besides if WordPress is providing you with an option of changing the username during installation, then why should you stick with admin? A week password to go with such an obvious username is the perfect recipe for disaster. So, change the username form admin to some other unique name. Your password and username should also be fairly long ones with an ideal combination of lower caps, numbers and special characters. Many developers follow a common practice of using the administrator account for posting content on the blog. This is another area which could make your website vulnerable to hacking. A new contributor account should be created for posting content on the website. The administrator account should be used only for other back-end tasks. While doing your WordPress installation, the process should be as invisible as possible. Predictability is your sworn enemy and stealth is your strength. Another problem of using the administrator account for posting content is that your username will get displayed below the content, making it visible to just about anybody. Never use the default themeThe default theme of WordPress is harmless, but that does not mean that it is appropriate for your site. The default theme should never be used for creating your site as it is very basic and might not have those special features that you site might require. Many novice web designers tend to stick to the default theme, which gives them a pretty basic website. A typical WordPress default theme is ordinary to look at and is also difficult to customize. The design structure of a website plays a pivotal role in increasing its search engine rankings and a theme defines its basic structure. Ideally three most important things have to be kept in mind while choosing a new theme for replacing the default one. First of all it should be simple to use, should not be very expensive, and should be from a reputed developer. Free themes are not a bad option either. It should not be very difficult to find a decent WordPress theme which is also free, with a sizeable WordPress developer community which exits. A lot of free themes are available in the WordPress Themes directory. In case you want to spend money for buying a theme then try fining it on Elegant Themes, StudioPress, Themify, Headway Themes or ithemes. Do you backup your site regularly? If the answer is no, then you are not just committing a mistake, but a blunder. A backup is a safety precaution for protecting your hard work. In case your website gets corrupted, you would lose your hard work, which took you days to accomplish. If you have a backup of your site then you can restore it anytime and avoid starting from scratch. The most standout tool for taking a backup of your website is VaultPress. We realize the need for backup only when it is too late, and a backup is required for restoring the site. WordPress has the options of both manual as well as automatic backups. You should always initiate a backup process while updating your site. Remember that nothing is 100% foolproof and crashes can happen anytime. If you are using the wordpress.com platform then you can create a backup by selecting the tools option and then the export option in the dashboard. In case you are working with wordpress.org then you can take a backup by going to the phpMyAdmin. A web developer could falter in choosing the right images for his site. Basically images need to be selected in the right format. For instance a PNG file is much larger file in comparison to JPG. JPG format images have a smaller size and load-up quickly, so should be preferred to PNG. Many web designers also commit a serious mistake of lifting images straight from Google. This is a bad practice which could land a web designer into a legal mess involving copyright infringement issues. Images should be sourced from reliable and trustworthy sources. Another aspect of choosing images for your site is choosing them based on their clarity. Hazy images which tend to blur out on small mobile screens. Using too high a resolution images will increase site loading times. So you should opt for SVG (Scalable Vector Graphics) images, which are much lighter and can be rendered easily on all screen sizes. Image optimization is another technique for keeping the site load times under control. Optimized images look good on all screen sizes and also provide performance. So optimize images before uploading them on your WordPress website. Using no-responsive themesThis is another mistake which could cost dearly to a web developer. Responsive design is a basic requirement of web designing today. Nobody, Google included, likes a website which is not mobile friendly. A WordPress theme which is old and outdated will not be responsive. So a developer must choose a new theme which is responsive and also SEO friendly. New WordPress themes are designed using HTML 5 for achieving maximum responsiveness. Separate plug-in is available to convert your existing WordPress theme into a responsive one like WPtouch and WPTap. Replace “wp-“ prefix from tablesIf you are unpredictable, then you can consider yourself safe. The default table prefix for all WordPress sites if “wp-“, which hackers can easily predict. The table is the place where all your site files are located. If you change the table prefix to something unique, then you become unpredictable for hackers. This is an important safety precaution which is hardly followed by any web designer. A designer can either change the table automatically during installation or manually later on. For changing it manually you have to make changes to the wp-config.php file. External CSS filesExternal CSS (Cascading Style Sheets) files are required by WordPress sites to work properly. But a developer must not commit the mistake of using too many external CSS files as it will slow down the site. It would be much better to use a single CSS file even though it may be large instead of using multiple but small external CSS files. CSS files can be used in WordPress sites in many ways. CSS files should also be optimized before they are used with the site. The way in which it is used only decides how your site performs. In conclusion, learning from mistakes might be a good habit, but if mistakes can be totally avoided then it is far better. What is the idea of faltering first and repenting later? Remember that prevention is better than the cure.